Chase Jeter came into Duke last season as one of the most highly recruited players in the country (#11 RSCI), but struggled to earn playing time even with his team severely lacking front-court depth, battling foul trouble and confidence issues virtually every time he stepped on the floor. Jeter will have another opportunity to showcase his skills as he heads into his sophomore season but now has to deal with a number of highly recruited freshmen such as Harry Giles and Marques Bolden, as well as the return of Amile Jefferson. 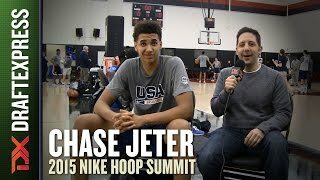 The Adidas Nations was a good format for Jeter perform without having to worry about foul trouble or playing time, and the lack of high-level big men gave him a nice opportunity to gain confidence in this setting. At 6'10 and just 18 years old, Jeter already has the size of an NBA big, which he used to control the glass at the Adidas Nations, finishing second in rebounds per game at 6.8, an area that was always a strong point of his at the high school level. On the offensive end of the floor he is able to contribute in variety of ways, but looked comfortable in Los Angeles screening and diving hard to the rim, a skill that will definitely benefit him once he gets to the pro level. He is a fluid athlete who looks smooth running the floor and finishing above the rim in space, and has some limited ball handling abilities which he has shown he can use in a pinch in the face up game. He has already showed some nice footwork in his back to the basket game as well as the ability to finish with either hand, but can often get away with using his size and length to work his way to the rim. He'll have to learn how to recognize double teams and pass out of the post, as at times he looked somewhat rushed looking for his own offense. Defensively, while he can definitely be a factor on the glass, he also some potential as a rim protector given his size, mobility and big standing reach. He seems to have a good grasp of help defense, but could stand do get stronger and tougher so he can deal with some more physical players on the block. Despite a disappointing freshman season, it appears its too early to give up on Jeter given his age, size, rebounding prowess and budding skill set, and it will be interesting to see where he gets his chances with what appears to be a loaded Duke roster next season. Against decent competition at the Adidas Nations, he showed he is capable of being productive, and it is likely only a matter of time before he gets that opportunity on the college level. Chase Jeter, as has been the case throughout his career at the youth level, measured out well for a big man. Perhaps the most impressive element of his physical profile is his nearly 240-pound frame, which he's added some 10 pounds to since he was measured by USA Basketball last summer. Jeter, as it stands, is only slightly smaller than Greg Monroe, who measured 6-11 with a 7-2.25 wingspan and a 247-pound frame in 2010. His body, like so many other players on this US team, appears college ready. His standing reach appears to be long enough to see plenty of minutes at the center position certainly at the college level, and even in the NBA. Outlook Did not have the most impressive showing. Was cut from the team by coaching staff but then brought back at the last minute when another player was forced to withdraw due to family issue. Still in an early stage of his development. Will likely improve athleticism as body fills out. Needs to figure out how to play harder, tougher on a more consistent basis.